Battle of Stalingrad facts research papers discuss the battle that ultimately ended Germany's eastern expansion and regime. Battle of Stalingrad Facts research paper due and don’t know how to start it? How about like this? The Battle of Stalingrad was the turning point of the Eastern Front of World War II. Having lost great amounts of territory to the advancing Nazi forces, the Soviet army and citizens made a last stand at the city of Stalingrad, named for their Communist leader. 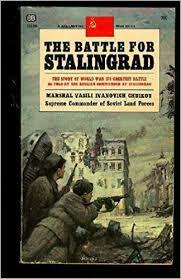 This battle would prove to be the military and ideological turning point of the conflict; because the Soviets were able to stand against the Nazis for such an extended period of time, they were able to wear down the enemy’s forces, ultimately outnumbering and out supplying them, and forcing them into submission. The battle was also a morale issue for the Soviets; if they had lost the city of their leader’s namesake, they would be ideologically decimated, and the whole of the Soviet territory would have likely fallen to Nazi control. This battle raged through the winter season of 1942-1943; the Nazis were ill-equipped for the harsh Soviet winter, a lesson that Hitler did not learn from his predecessors. Stalingrad was the communications center of the Soviet Union; it was also a critical manufacturing city. While it appeared as though the Germans were likely to win in the beginning, the war of attrition that soon followed would be their demise. Battles for control of individual streets broke down to basic hand-to-hand combat; snipers were a common element on both sides of the battle. Hitler, however, was as resilient as Stalin; both ordered their men to fight until the last bullet and life had been lost. Ultimately, there were simply too many Soviets and the German supply lines were stretched too thin. The Nazis surrendered various parts of the city at the end of January and beginning of February, an action that signaled the end of their eastern expansion, and, subsequently, their regime as a whole. WWII - World War II was a definitive time in world history. Learn how to write a WWII research paper from Paper Masters. Nazi Germany's Negative Anti-Semitism Propaganda - Nazi Germany's Negative Anti-Semitism Propaganda Research Papers examine how influential the propaganda was on the Jewish people before and during the Holocaust. Stalinism - Stalinism has been used to describe a wide variety of political ideologies and methods of social organization, and is often associated with dictatorial or totalitarian control of the state by a small leadership cadre. Hitler and Communism - Papers from Paper Masters report that Hitler was key in the spread of Communism. Rise of the Nazi Party - Rise of the Nazi Party research papers discuss the events leading up to and during the rise of the Nazi Party. Third Reich - Third Reich research papers overview the time between 1933 and 1945 where Germany was under Nazi rule. Federal Republic of Germany - Federal Republic of Germany research papers dissect Nazi Germany after World War II and its attempt to rebuild itself. Adolf Hitler's Life - He founded the Nazi party and won political support due to his platform focusing upon the restructuring of Germany after the crushing defeat in World War I.
Fascism - Hitler's 1920 Nazi Program differed from the overblown nationalism of Mussolini in several important ways. Order a research paper on Fascism from Paper Masters. Hitler's Willing Executioners - Hitler's Willing Executioners Research Papers look at Daniel Goldhagen's book regarding Hitler's men. Battle of the Bulge WWII - Battle of the Bulge WWII research paper discusses the battle that symbolized the end of Nazi's power on the Western front. Totalitarian Governments - Totalitarian Governments research papers look into governments that prevent citizens from having any freedoms, and take the power away from individual citizens in order to increase the power of the state as a whole. Bombing of Hiroshima - The first atomic bomb dropped during the Bombing of Hiroshima, which changed the destiny of politics for the remainder of the century. Yalta Conference - Churchill and Marshall Joseph Stalin, met at the Black Sea resort of Yalta in order to discuss the makeup of post-war Europe. Khrushchev and Soviet Socialism - Socialism Term Paper looks at the reasons why Soviet socialism failed. Get help on Soviet Union History Papers that talk about Joseph Stalin and Karl Marx. Dictatorship - Joseph Stalin custom research writing on the dictator of the Soviet Union from the mid-1920s. Psychodynamic View of Adolf Hitler - Psychodynamic View of Adolph Hitler research papers on the psychology of Hitler. Adolf Hitler's Death - Custom research papers on Adolf Hitler's death explain what lead him to commit suicide and what was done to his remains. Adolf Hitler's Beliefs - Adolf Hitler's Beliefs research papers discuss Hitler's beliefs on politics, religion, and the culture human beings. Explaining Hitler - Explaining Hitler research papers review the book by Ron Rosenbaum on the Search for the Origins of His Evil. German Militarism - German Militarism research paper attempts to make the case that the primary cause of World War II was German aggression and militarism. Paper Masters writes custom research papers on Battle of Stalingrad facts and describe this battle as the turning point of the Eastern Front of World War II.